I remember a colleague when I taught at the University of Arizona who said of a guest speaker's paper: "There was a lot that was interesting and correct in it. Unfortunately, what was interesting was not correct and what was correct was not in the least interesting." Some would say that the cable corner of the high-end market suffers the same fate. There are some tried and true methods that are uninspiring and promise little in the way of advancement. Then there are allegedly profound hypothesis with great promise only to be undone by their obvious implausibility. Fortunately, this is not always the case. There have been genuine advances over the years in interconnect and cable design, with a promise of more to come. There is every reason to believe that Stealth Audio Cable's Indra cable is one such product. Introduced this past year, the Indra has received stellar reviews by our editor/publisher among others and has found its way into many systems in the United States and elsewhere. I am a strong believer that part of what is distinctive of the high-end is not just the quality of sound reproduction but the art of its reproduction. I am using the term 'art' loosely here to cover a range of attributes that would include artisanship, craftsmanship, design and artistic vision. In general, part of what is distinctive of the high-end is the embodiment of a creative vision in some audio component - or in some cases a system as a whole. This feature has little to do with the price of components in absolute terms. A $2,500 preamp like the latest offering from John Tucker of Exemplar Audio is the embodiment of his creative vision and his view of the importance of shunt regulation and active loading as much as is the most recent $60,000 amplifier of Kondo-san the reflection of his distinctive vision. What matters is not the price but the connection of the creative impulse to its expression in the work. For me, this nexus is part of high-end, valuable and worth celebrating. I try therefore in all my reviews to reveal something about the man (woman or group) behind the products in part because I believe that one of the distinctive features of products produced in small numbers and "by hand" (metaphorically sometimes, literally others) is how the personality as well as the vision of the designer comes through. It is illuminating to put the person together with the product. Needless to say, some of the designers are more interesting than others; they vary as much as their designs and visions do. Some are more colorful than others and you can see it in their work. 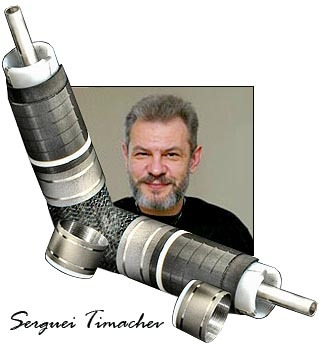 In my years in the high-end, I am not sure that I have come across a more colorful personality than Serguei Timachev of Stealth cables. He is a walking contradiction. He is supremely confident about his approach to cable design but is at the same time extraordinarily modest about the level of his current achievement. He can seem severe and unforgiving yet he is more generous than anyone I have met. If you suggest to him that you know someone extremely trustworthy who would benefit from listening to one of his cables, he will send out a loaner the next day. I once recommended that he listen to a system and he traveled 300 miles as soon as he could arrange to do so in order to listen to it. There is one thing about him that shines through. He is completely driven by one preoccupation - and that is to produce the very best of which he is capable. He can be extremely critical of himself and others, yet he has an unshakable confidence in his ability to produce the best. I have known few people with less tolerance of compromise and a broader definition of what constitutes compromise. The phrase 'perfectionist' is very much overused, usually to cover personal failings of achievement. Serguei is a perfectionist who does not suffer fools gladly and is as critical of himself as others. All this came through in an interview I conducted with him in person, via email and over the phone in the course of the last four or five months. Both of us were intermittently busy with other projects so it took longer than either of us expected to complete the interview. he admires fine things and he has seemingly endless energy for pursuing the things to which he is drawn. When he was looking for a new car, he was after a particular model of a particular make. He discovered that eight of them had found their way into the U.S market. He eventually located one in New Hampshire (I believe), flew up there and bought it. No dealer anywhere could convince him to buy a near substitute for the particular car he was after. He was planning to drive the vehicle back to his home outside Washington, D.C. when we arranged for him to come by to drive together to NYC and start the interview. You should have seen the grin, the smile and the pride on his face that he had the car he wanted. He came into my house, we chatted for a while, had a cup of coffee and I told him what my intentions were for the interview while we headed out to the car. I expressed my approval of his wheels of choice and next thing I knew, he handed me the keys to drive it. He wanted to share his good fortune - especially with someone who might appreciate it. If he has it and you would like it, you can have it, too. That's Serguei. Unyielding yet unambiguously generous - no strings attached, ever. Hands on the wheel, eyes on the road, scared to death that I might get us in an accident, we headed out down the Merritt Parkway. What came first for you, the music or its modes of reproduction? I grew up in the former Soviet Union. I displayed an interest and competence in music so I was enrolled in what you'd call a music conservatory in the United States. I was a student for nine years and was educated in performance, theory and composition from my earliest years. My particular instrument was the piano. Was music a part of your family's life? My father had a modest income and he had an old tube-based system and we listened to music on it to a fair amount. 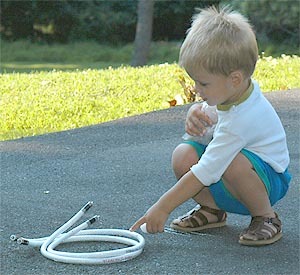 I was not particularly drawn to the equipment as such at least when I was young. I was not like many high- end designers who were modifying everything in their and their friends' houses when they were young teenagers. How did you go from music to music reproduction? student. Eventually, I pursued Ph.D. work on mathematical modeling of certain problems related to electrical and mechanical engineering. Upon leaving the university, what did you do? I was young, restless and bold. I spent nine years studying at the University - ain't that enough? I am and have always been more interested in the work itself than simply clocking in at the work site to pretend being present. So I quit my Ph.D. program and went about doing real-life engineering on mostly a contractual basis rather than pursuing a theoretical teaching career. In parallel with my engineering work, I spent a lot of time with my professionally performing musician friends, wrote a number of technical and even some audio-related articles, recorded several music albums, spent two years studying filmmaking and wrote scripts for several comedies, three of which were actually shot. What brought you the States? I wish I had a story of woe to tell you, something that would make it interesting. But the truth is, I came because I was curious. The States fascinated me a great deal so I welcomed the opportunity to "come and see". What sort of work did you do when you first arrived? I worked in a variety of computer-related fields for various government agencies in Washington, D.C. My then-wife and I settled in the Washington area. I stayed. I like it here. I liked my work but it was less than I wanted to do over the long term. So what got you involved in the audio industry? And why cables? More than that, really. Ultimately, I am interested in building entire systems but I obviously couldn't open up a factory and start making a full range of components - CD players, amplifiers, speakers, all advanced and all at once (laughs). Designing a truly good component requires a lot of R&D. Simple measurements alone cannot explain the sonic differences. Are you an objectivist then about reviewing and evaluating components? The debate is very badly framed. It's not just about numbers. There are scientific reasons, advanced measurements and theories that at least partially explain why cables or components sound the way they do. It's not snake oil. It is not just a question of measurements. We know a lot about what will affect performance, especially about the role of resonances inside cables both mechanical and electrical. We know something about how insulation and geometry affect those things. No one talks about it in detail. Most reviewers don't understand it and there aren't enough semi-technical discussions that educate the consumer. So you made your first cable and marketed it. What was the basic strategy you had for improving on the performance of other cables? What was the first thing you offered up? Nothing advanced, just better and cheaper than most. My first interconnects -- immodestly called Fineline Reference -- were extremely thin solid-core silver wires, two conductors, nothing fancy, just extremely thin and hermetically sealed inside the support tubing. They were barely thicker than a human hair and had separate shielding, e.g. shielding detached from the ground path which is also called "source terminated". That was it. One must grow as one's learning deepens. However good two shielded thin wires are, they are far from perfect. There are problems. The largest problem has to do with resonance control. A coaxial cable or one made of two twisted or parallel conductors -- i.e. equidistant over the length of the cable -- has a very pronounced resonance in the RF region. The RF that everyone talks about is well beyond the human hearing range but the intermodulation artifacts -- the subharmonics of two or more closely related RF frequencies as emphasized by this resonance -- do occur right in the audible range. So making a less resonant cable calls for an advanced geometry and more than two simple conductors. So I take it that you think too little attention has been paid to resonance control? What are the resonances within cables that a designer has to be attentive to? There are mechanical and electrical resonances. Tell us about both and what your approach is to eliminating them. Sure. First, you have to be careful. You want to eliminate electrical resonances and optimally dampen mechanical ones. To minimize electical resonance, you need to develop a proper geometry for your cable design. My approach is to have varied, complex relationships among the conductors in a cable that are not in a repetitious pattern to minimize resonances and to have many small ones that are not likely to be sympathetic to one another and which will not amplify. Geometry is very important to proper cable design. damp, you get lifelessness. You cannot eliminate mechanical resonances completely but you can control them which is why insulation and jacketing material become important. I use a different Teflon than most other designers. It is a Teflon with embedded air bubbles that's much softer and more expensive than the more commonly used variants. It sounds 'fast' because of its ultra-low dielectric constant and I also use it for its resonance control properties. And this may be an odd comment but all my cables and interconnects are exclusively made by hand. I do this for three or perhaps more reasons. I work with conductors that often can only be worked with by hand. That is certainly true of the amorphous material in the Indra. I also believe that hand-made products cannot help but show the personality of the builder and I like that. Finally -- and this is actually related to resonance control -- there will always be an irregularity of patterns when things are done by hand rather than by machine. And in the case of resonance control, irregular patterns in the geometry are a good thing, I believe. I am glad you mentioned the Indra because that is what most people will be interested in. The conductor in the Indra interconnect is an amorphous metal. How did you find the metal? Well, I won't say that it found me. Honestly, Jules, I was ready for the Indra. I mean, my ideas had been developing and I had several things that I thought would go into an ideal cable - ideal within my way of thinking, of course. What I needed to put these ideas into a product was a certain kind of metal that was strong enough to be made into an ultra-thin conductor and didn't have the inner grain of crystal boundaries and the impurities associated with this internal grain. The 'single crystal' continous-cast wire was not strong or good enough. I knew about liquid metal exisiting in solid form which is amorphous wire. Back in 1982, I published an article in one of the Russian journals about such metals and their properties but not now or in the next millennium could I afford to manufacture such amorphous wire. Fortunately, I was able to secure some amorphous cable that already existed. The wire was not made especially for me but since you are a lawyer, I will tell you that I obtained it legally. I am a law professor, not a lawyer. No one in her right mind would hire me to represent her as her lawyer. Still, I am comforted to know that you did not break the law to obtain the amorphous materials. So now tell me about the amorphous metal. Sure. The first thing is that you have to know that though the Indra is the only interconnect that is made from this exotic amorphous material, this is only one of the nine elements that I had in mind for the ideal cable. It is the nine elements together that make up the Indra, not just the amorphous metal. Fair enough. Let's begin though with the amorphous metal that you obtained legally. 100 milli-amps of current. Now we come to the feature everyone mentions but may not understand. It is amorphous which means it has no internal crystalline structures or boundaries. This means that it has no barriers and is consistent from one end to the other. It is by definition the most consistent conductor possible - and it is a wonderful conductor as I just mentioned. The downside is that it's rare, expensive and fragile. Let me indicate how expensive via a comparison. When I obtained the amorphous conductor, I thought I would insulate it with amorphous Teflon. So I looked up Dupont who owns the Teflon trademark. They produce several types of Teflon. One is amorphous and called Teflon AF. "Great!" I thought, and immediately contacted Dupont to get some for use with the Indra cables. What a perfect combination, amorphous wire and amorphous Teflon (this type of Teflon has slightly superior characteristics compared to the "normal" i.e. most common and regularly used Teflon PTFE). This regular and most widely used Teflon PTFE costs $7 per lb if bought as a raw resin. Imagine my surprise when I learned that the amorphous Teflon -- virtually the same material offered by the same company, just without any crystalline molecular boundaries -- costs $20,000 per lb. So it is very expensive but that's not all. You can only work it by hand and unavoidably, you still break some. I also had to develop a special connector for the amorphous conductor that didn't involve soldering. I am perhaps more proud of this connector than the actual cable. Should we talk about the connector? Not yet. Let's finish the discussion of what else goes into the Indra. What are the other elements of the ideal that you were trying to realize in the Indra? I'd like to say one more thing about amorphous cable and its importance. The difference in performance between crystallized and amorphous material (of the same or very similar composition) is striking: hysteresis -- one of the most important parameters of magnetic materials -- is some 100 times lower in amorphous materials than in even the best regular non-amorphous materials. People are obviously going to want to know if yours are the only interconnects with amorphous metals? I can't answer that for sure. I know that van denHul claims to have an amorphous speaker cable. I did study up on it a bit. I would have to look inside to be sure whether it is truly amorphous. In any case, it is a completely different metal. I know it is at least in part zinc. There is no zinc in mine. Kidding aside, how did you get the amorphous material? come to the mind of every person interested in the Indra design. I have been thinking about how to address that and I have an idea but, unfortunately, the idea I have cannot be expressed in any words that come directly to me. That would be too much even for my immodest nature. Thinking about luck... take Isaac Newton, the apple that had fallen on his head from a tree above and which led to his discovery of the Law of Gravity. Was this a matter of luck? Yes. He was in the right spot at the right time to have this apple to fall on his head. In a way, I was in a similar position with the Indra. I was in the right spot to get the wire and I was lucky to make a cable design out of it. I am not Newton and the Indra is not comparable to the Law he discovered. But nevertheless, the situation is similar. We both were prepared to take advantage of the luck we had. Frankly, he did pretty well with his. He also did some real good. Maybe a word is in order about the connector that's on the production models but not on the beta tester models I saw before. Of course. 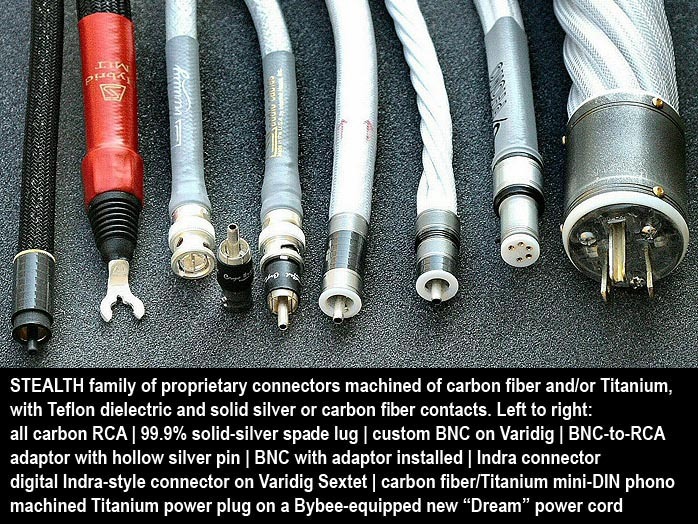 All Indra beta cables were made with Cardas Ultimate connectors. 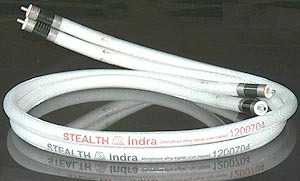 The production Indra has the proprietary STEALTH connectors. 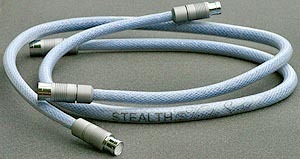 As for these new STEALTH connectors, they are obviously the most advanced connectors anyone offers and this is not subjective. They are the best on the market. Every possible aspect was taken into account. They are far better in each and every respect than any other connector from any manufacturer at any price - period. Needless to say, developing the RCA prototypes cost me quite a bit of sweat, effort, time and money, too. At the moment, I am able to make very limited quantities of these RCAs in my laboratory prototype shop and my cost is some $200 apiece (which is ridiculous and suitable for experimentation only so I put them only on Indra and, with the characteristic impedance corrected, on my new digital ultra-resolution Varidig Sextet which is 6 Varidig cables in one. [Editor's note: I will be reporting on the performance of the Sextet down the road - shown at right]. The amorphous wires are not solderable. 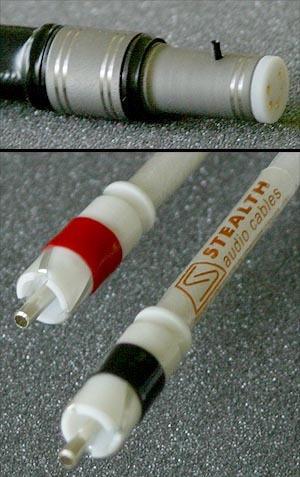 The STEALTH connectors are an integrated part of the Indra cable, and the wires are scrimped into the inside part of the hollow center pin and supported inside the pin by the Teflon-covered Kevlar composite insert, with the conductors symmetrically arranged around the diameter for a seamless cold-weld connection. Why are they better than others in your opinion? Of course you have to listen and be your own judge. I like the new WBT and the Cardas but for the Indra, the conductors for the WBT had to be crimped to an intermediate "splice" (since the amorphous wires themselves can't be soldered) and then the splice was soldered to the actual WBT contacts. The same technique was used for the Cardas connectors. In other words, with the WBT and Cardas there was an extra solder joint at each end of the cable, while the STEALTH connectors avoids any tin. With it, the conductors are literary pressed into the soft silver and "transformed" into the solid-silver and very very light contacts. In a traditional RCA connector, the center pin is very thick compared to the conductors I use - in fact, 125 times larger in diameter. Imagine what happens to the music signal traveling along an ultra-thin wire when it suddenly encounters a chunk of metal (the center pin) that presents 1000 times the mass of the conductor itself. Are these criticisms of other designs? No. I want to explain why I think mine is better. In fact, let me be honest with you. It's very easy to make a decent cable. Just read the "Essex Echo" by Malcolm Omar Hawksford. Take two thin oxygen-free copper (or pure silver but stay way from silver-plated copper!) wires preferably in Teflon insulation, twist them together, insert them into some soft of tubing (thus creating a support structure to prevent the fragile wires from breaking right away), attach the best connectors you can buy and voilà, there you are. Want better? Buy and read Allen Wright's Cables Cookbook, pick one of the 'recipes' and follow the directions. Want to make excellent cables? Care about the difference? That's another story altogether. I make excellent cables. I don't want to make any other kind of cable. I am always learning. Nearly everything I did before the Indra were steps along the way, not compromises. It's only a compromise when you do it on purpose. I was and am learning. I hate compromise. 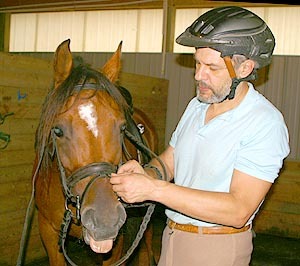 My hero in cables is George Cardas: the man, the engineer, the product and the company. George is an excellent engineer and designs to a specific price point and exclusively in copper. He sets a different goal and achieves it with flying colors. My aim is to design the best thing, period, money no object. I use exotic materials - my RCAs are machined from Titanium, for example. Also, my cables are 100% made by hand. Do you have any idea how difficult it is to train people to make perfect things by hand? I am not a one-man operation (or two-man operation, three-man operation). I do not make the cables I sell. 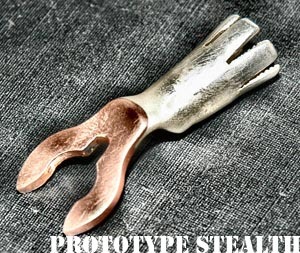 I design them and make prototypes, then the manufacture goes to my guys. My little niche is the very top end of the high-end. Cardas has a much broader market. Nobody can achieve what he has done. 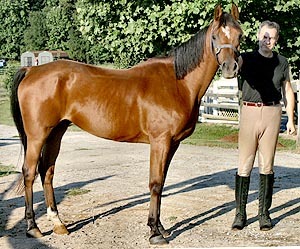 There would be no high-end for me to aspire to without him. Speaking of inspirations, who else inspires your work? This may seem crazy but I am inspired by Linn, Meridian, Kondo and Shindo. There may be others I don't know of who would inspire me if I knew their products. I love the Japanese designers because of their sensibilities. Every part of their system expresses who they are and what they believe in. You cannot listen to their equipment without sensing that. I am a romantic. I am Russian. All Russians are romantics. Also, Kondo and Shindo make complete systems. Kondo doesn't make a turntable, Shindo doesn't make a digital product but they make everything else. One sensibility from beginning to end, one idea realized in a complete system. Linn and Meridian do the same but of course in a much more commercial way. I am an American. There's nothing wrong with the commercial way either. I love the idea of a complete system. If you own a complete one-brand system and live in the US, then you're not considered an audiophile - and God forbid a reviewer should have a complete system from one designer. That is crazy. A reviewer should have a system whose sound he knows, which is coherent and makes sense as a whole. Does that mean I should use Shindo cables in my system? Does that mean you are planning to create such a system? Yes. I will always make cables because I am good at it and I need to feed my family and I love the design work. But I want to build a system approach, more even than the people I mentioned. I want to design systems that begin with proper grounding outside your house, go to power cords, all components, speakers, room treatments and even the room. I want to design entire music reproduction worlds for people. Of course, I will make variations for people who already own their own houses. I assume it will sound wonderful but I care more about doing it and trying to do the best. Nothing else excites me. Have you started in this direction? Of course. 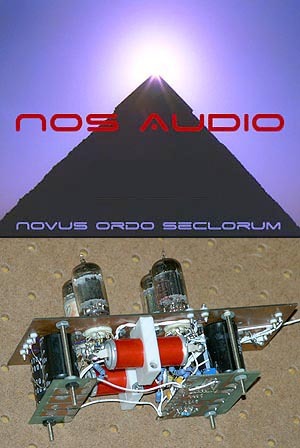 I am putting together a venture with other people called NOS to build electronics and crossovers first. I am working with Jerry Ozment whom everybody knows and Ted Lindblad. Ted is doing the marketing and chassis work and Jerry is working on the digital side of the project. We will have products to hear soon, I hope. I won't be happy unless my amplifier is as good as your Shindo. No, I won't be happy unless it is better. Of course, you won't be able to hear it that way. And for me, it will have to be better than Kondo, too. And if it is better than neither, you won't be able to hear it that way! We began by your telling me that you started off by studying music in a conservatory but you didn't mention why you quit. Why did you not pursue a career in music? That's the easiest question of the day to answer. I studied music from when I was 6 years old. I attended a music school 4 to 5 times a week until I graduated at the age of 16. It was a specialized serious school for children who planned to be professional musicians. I played piano and guitar until I was some 22 years old, when -- having a lot of musician friends - - I realized that they did some things better. They played better, sung better. To me, if I am not the best or do not have the potential to become the best in a certain area, then it's not worth making this area my profession and life's work.